Even if you’re not thinking of selling, it is always good to consider how remodeling will impact the value of your home. It is more important to get it right If you’re thinking about putting your home “for sale”. Some renovations have a poor return on investment, while others will pay you off the greatest returns. 1. MAJOR & MINOR KITCHEN REMODEL: Kitchen remodeling can be done as simple or as elaborate as you like. This is the best place to invest your renovation money as it brings the highest return and makes a home easier to sell. However, to maximize your return keep your total investment to under 20% of the value of your home. If you over improve you will receive less of the investment back. This project can have you seeing a whopping 85% return on your investment. 3. REPLACEMENT: If you find yourself sprinting for the buckets when it starts to sprinkle, getting a new roof should be your No. 1 to-do. Measuring rainfall from the indoors isn’t cool. 4. DECK ADDITION: If your home is your castle, your yard is your kingdom. After giving your yard a much-needed overhaul, you need a place to watch over your handiwork. How about that deck you’ve been dreaming of? 5. GARAGE DOOR REPLACEMENT: No surprise that a garage door replacement project made it onto this #winning list a new garage door provides a big boost for your home’s curb appeal at a relatively modest cost. 6. SIDING REPLACEMENT: This is not all that common in South Florida since many of our homes are Concrete Block however frame homes might benefit from siding. In any color! And never paint again. Those are two of the three benefits of vinyl siding. The third, of course, is your home’s value. But if long-time homeowners look at you funny when you mention vinyl siding, just tell them that today’s vinyl is way better than what they remember because of fade-resistant finishes and transferable lifetime warranties. Want engineered siding instead? It also shows a high payback of 78.6%. Although it’s the pricier option, you’ll spend $13,832 and get RESALE VALUE: 78.6% of $10,866. It has one thing vinyl still lacks the perception of quality. And quality matters. 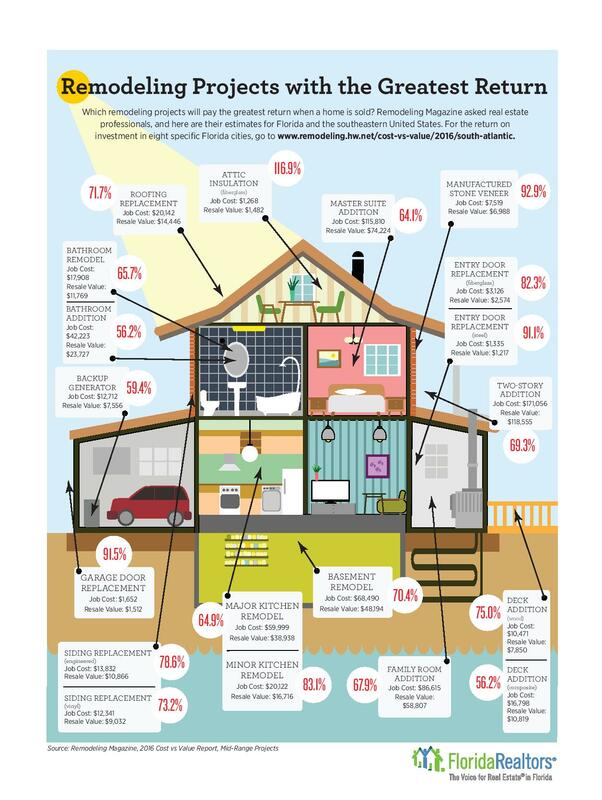 In a survey from the National Association of Home Builders (NAHB), “quality” was one of the most important traits that home buyers focused on when house hunting. 7. ATTIC INSULATION: Insulation is the smartest way to save energy, so insulate your attic. Insulation is tucked out of sight, so it’s often out of mind-adding attic insulation delivers the greatest return on investment. As energy prices rise, it means deep applications of attic insulation make more economic sense. 8. MASTER SUITE ADDITION: A straightforward addition of a master suite is typically a perfect investment. Updating a master bedroom or remodeling and adding a new master suite is money well spent. The buyers will picture themselves living in their private space, and it’s of quantitative value when they like what they see. Build a classic Master Suite Addition, and your life will never be the same. 9. MANUFACTURED STONE VENEER: When it comes time for you to sell your home, remember that perception is everything. You want prospective buyers to see the quality of home in every part even if it is only perceived value. Manufactured Stone veneers are a perfect example of this. In a recent Real Estate Pro Magazine article, experts agreed that stone veneers led buyers to believe that the home was of higher quality than it actually was. It gave the house that polished finished look that all home buyers desire. 11. BACKUP GENERATOR: Backup power generators offer families peace of mind during emergency situations, like a weather-related natural disaster. During utility power outages, standby generators provide the home with an automatic supply of backup power using a transfer switch and power management system. This enables homeowners to run appliances such as sump pumps, air conditioners, heaters, refrigerators, clothes washers/dryers, and lights. Any remodeling or home improvement project that increases the home’s livability while also recouping a large chunk of the project investment is worth considering. Generators and other storm protection increase in perceived value after a storm event. Clearly, some of these projects will make more sense for your home than others. If you're considering selling your home, then just one of these projects could add thousands of dollars to the price you'll be able to get when your home sells.